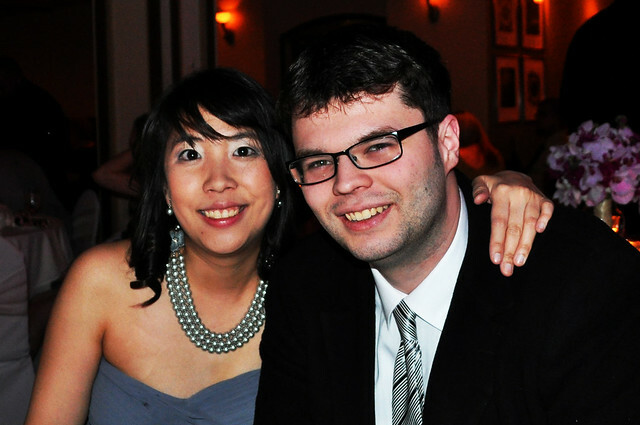 Marcus and me at a friend's wedding, March 2012. Today, Marcus and I will have been together for two years. It seems as if we've known each other for many lifetimes, yet it also peculiarly seems as if it were yesterday that the online dating enterprise, eHarmony, matched us with its "mysterious" algorithms resulting in us finally deciding to meet face-to-face. I suppose that is what happens when you meet your other half (after all, I had only been active on eHarmony for barely an hour when he was dubbed my first "match"). Call me cheesy, call me a dreamer, call me delusional -- whatever you like. For me, it is just how our story unfolded into where our lives lie today. Our relationship began, and continues to thrive, on our love for words -- words themselves, puns, homophones, crosswords, and Scrabble, just to name a few -- that can be best explained by the little anecdote I shared last year (that is, the one I wrote about our visit to the Swanson Salon at Swanson Vineyards in the Napa Valley). But more importantly, our relationship also grew with something so very basic to life: food. The first conversations we had were inevitably about my love for food and how it has an important aspect of my life and how it has been for him as well. Who knew that this common interest would carry on to blossom us into a food-obsessed couple? The trips we've planned and taken together are, for the most part, pretty much focused on eating and nomming away -- what we'd be eating, where we'd be eating, when we'd be eating, with whom we'd be eating, and how we would make it feasible. It was never something we argued over -- there was an unwitting understanding between the two of us. I'll call it the wavelength of food lovers because with this, we have been in total synchronization without skipping a beat. And while I'd like to think that I've exposed him to all kinds of dining experiences (whether it be with a particular ingredient, at a new location, or just learning together about something new), I'm happy to say that he's the only one with whom I've first experienced the gastronome's ultimate milestone -- that is, dining at Michelin tri-starred establishments (namely The French Laundry, Le Bernardin, and Eleven Madison Park, with Alinea to be added to this *hopefully* ever-growing list later this year). I am so thankful to be able to look back on these two years, only to say, "Damn, have the two of us eaten well!" Which brings me to why I'm sharing all of this with you. If you've been following my dining reviews and the tales of this gastronomy-focused life, you'll know quite well that Marcus is much of a star as I am. Most of the meals I have are with him these days, and I'm very fortunate to share my life with someone who completely understands this foodie madness that continues to live and breathe inside me. With that being said, instead of just talking about starting a blog, I have Marcus to thank for the existence of Four Tines and a Napkin today, mostly in part because he strongly encouraged me to finally pursue it. He was the final push that sent me head first into the world of food writing and blogging, and I have not looked back since. While Four Tines is where I record and share my life in meals, it also documents the story of our relationship, one that is also measured in meals. May Four Tines continue to grow along with us. :] To continue this spirit of meals, we're celebrating with our tradition of a "dual-dinner" as we did last year -- that is, one dinner near us (this year's in Philadelphia; last year's in Manhattan) on or near the actual date and another dinner that aligns with our travel plans during the year (this year's in Chicago next month; last year's in the Napa Valley). Happy Anniversary, Marcus -- I cannot express completely in words how much I love you, but hopefully this will be a start. Thank you for being my lobster and for turning me into somebody loved -- here's to many more years filled with delicious meals and memories together!